Leading transhumanists from a variety of backgrounds and perspectives provide concise, powerful statements as to why they are transhuman. The Transhuman Era has arrived; some of us are aware of this already, whereas others are transhuman but do not know it yet. The #IAmTranshuman campaign helps illustrate how emerging technologies and the accompanying shifts in thinking are already transforming everyday life. This video was compiled and formatted by Tom Ross, the U.S. Transhumanist Party / Transhuman Party’s Director of Media Production. Learn more about the #IAmTranshuman campaign, the Transhuman Present Project (#TranshumanPresent), and how you can readily participate here. You can participate in the #IAmTranshuman campaign by submitting still images or video recordings of one minute or less (15 seconds or less for Instagram stories, one minute or less for Instagram-compatible videos). Use the hashtag #IAmTranshuman, and let us know if you would like your video included in a subsequent compilation! Become a member of the U.S. Transhumanist Party for free, no matter where you reside. Apply here in less than a minute. 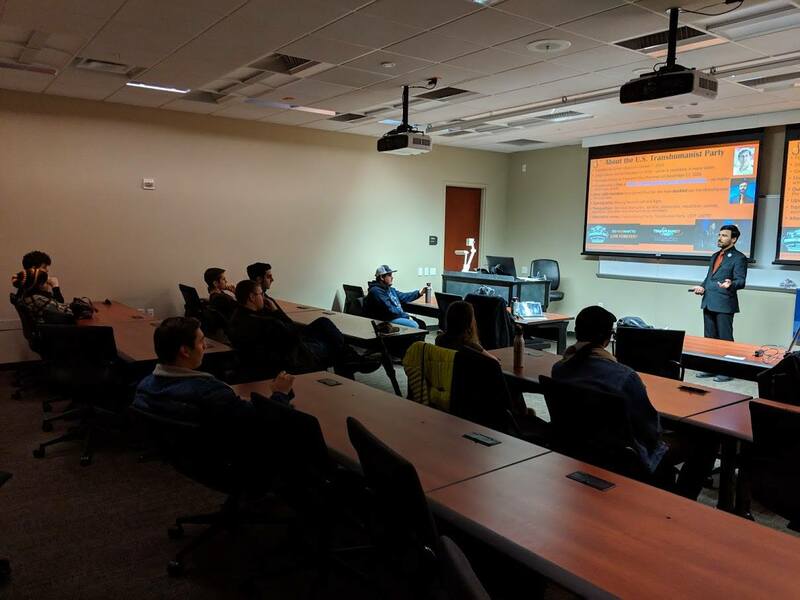 On February 13, 2019, Gennady Stolyarov II, Chairman of the U.S. Transhumanist Party / Transhuman Party, spoke to the Young Americans for Liberty Chapter at the University of Nevada, Reno (UNR) in a wide-ranging discussion on the intersection of technology and politics and the types of reforms that could pave the way to the new technological era of major progress and radical abundance. Watch Mr. Stolyarov’s presentation on YouTube here. Mr. Stolyarov discussed policy positions from the U.S. Transhumanist Party Platform, such as support for ranked-preference voting, greatly lowered ballot-access thresholds, simultaneous nationwide primaries, shorter campaign seasons, AI-assisted redistricting, germaneness rules for legislation, minimum consideration timeframes for amendments, and the general desirable shift in the balance away from special-interest lobbies and toward intelligent laypersons. See Mr. Stolyarov’s presentation slides here. Watch Mr. Stolyarov’s interview of Ray Kurzweil at RAAD Fest 2018. Watch the presentation by Gennady Stolyarov II at RAAD Fest 2018, entitled, “The U.S. Transhumanist Party: Four Years of Advocating for the Future”. The U.S. Transhumanist Party will again have a presence at RAAD Fest in 2019 at the fourth RAAD Fest in Las Vegas during October 3-6, 2019. RAAD Fest has been an excellent venue for building alliances and collaborations among supporters of longevity, health, and technological advancement and interfacing with a multiplicity of perspectives on these areas and their relation to politics and policy. To find out more and register, visit the RAAD Fest website at https://www.raadfest.com/. 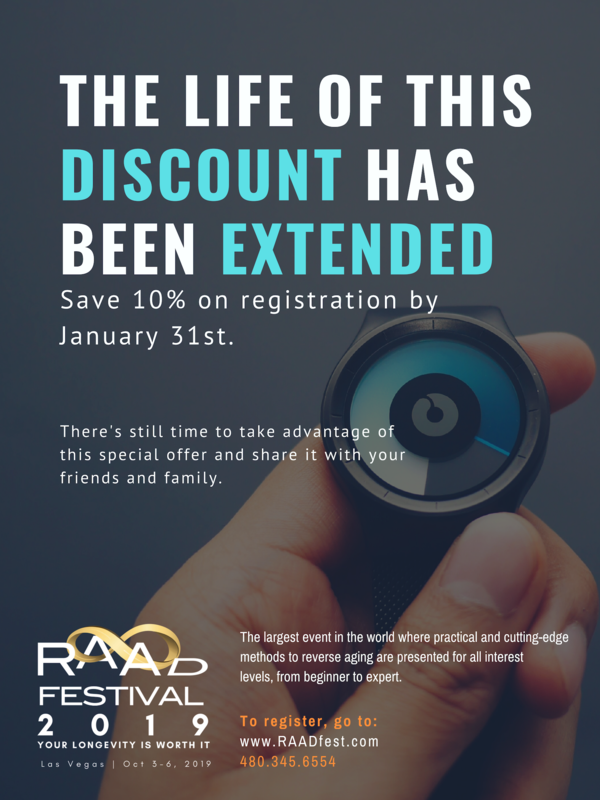 A 10% discount on the cost of registration applies until January 31, 2019. Watch the U.S. Transhumanist Party’s prior appearances at RAAD Fests in 2017 and 2018 below. You will want to be present for what we have planned in 2019! The Stolyarov-Kurzweil Interview has been released at last! Watch it on YouTube here. U.S. Transhumanist Party Chairman Gennady Stolyarov II posed a wide array of questions for inventor, futurist, and Singularitarian Dr. Ray Kurzweil on September 21, 2018, at RAAD Fest 2018 in San Diego, California. Topics discussed include advances in robotics and the potential for household robots, artificial intelligence and overcoming the pitfalls of AI bias, the importance of philosophy, culture, and politics in ensuring that humankind realizes the best possible future, how emerging technologies can protect privacy and verify the truthfulness of information being analyzed by algorithms, as well as insights that can assist in the attainment of longevity and the preservation of good health – including a brief foray into how Ray Kurzweil overcame his Type 2 Diabetes. Learn more about RAAD Fest here. RAAD Fest 2019 will occur in Las Vegas during October 3-6, 2019. 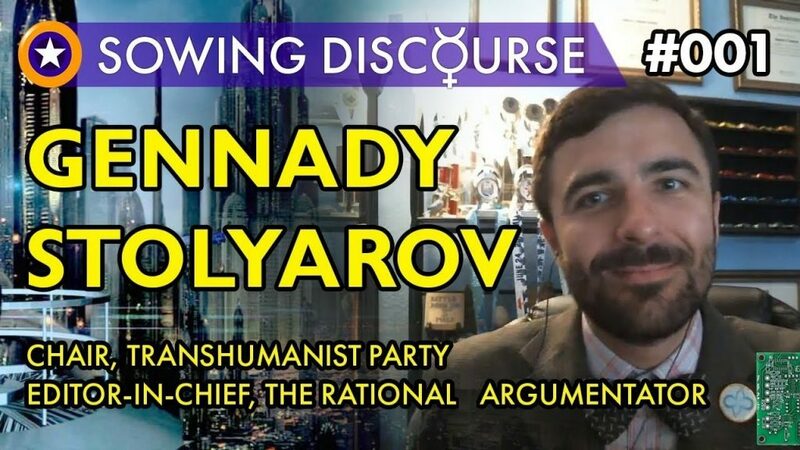 U.S. Transhumanist Party Chairman Gennady Stolyarov II was recently honored to be the first guest ever interviewed on the video channel Lev and Jules Break the Rules with Lev Polyakov and Jules Hamilton. Lev and Jules have produced this skillfully edited video of the conversation, with content references from the conversation inserted directly into the footage. For those who wish to explore broad questions related to technology, transhumanism, culture, economics, politics, philosophy, art, and even connections to popular films and computer games, this is the discussion to watch. This video was originally posted here. It is mirrored on Mr. Stolyarov’s YouTube channel here. Become a member of the U.S. Transhumanist Party for free, no matter where you reside. Fill out our free Membership Application Form here. It takes less than a minute! It is republished with permission. This is the video that American voters need to see prior to the 2018 elections. Watch it here. On October 7, 2018, the U.S. Transhumanist Party marked its four-year anniversary. On September 21, 2018, at RAAD Fest 2018 in San Diego, CA, Chairman Gennady Stolyarov II spoke in advance of this occasion by highlighting the U.S. Transhumanist Party’s recent achievements – including a doubling in membership over the past year, the revived Enlightenment Salons, a Platform that rivals those of the two major political parties, and Mr. Stolyarov’s own candidacy in 2018. Join the U.S. Transhumanist Party for free, no matter where you reside. Fill out our free Membership Application Form. It takes less than a minute! Visit the U.S. Transhumanist Party Values page. See the U.S. Transhumanist Party Platform. See the Transhumanist Bill of Rights, Version 2.0. 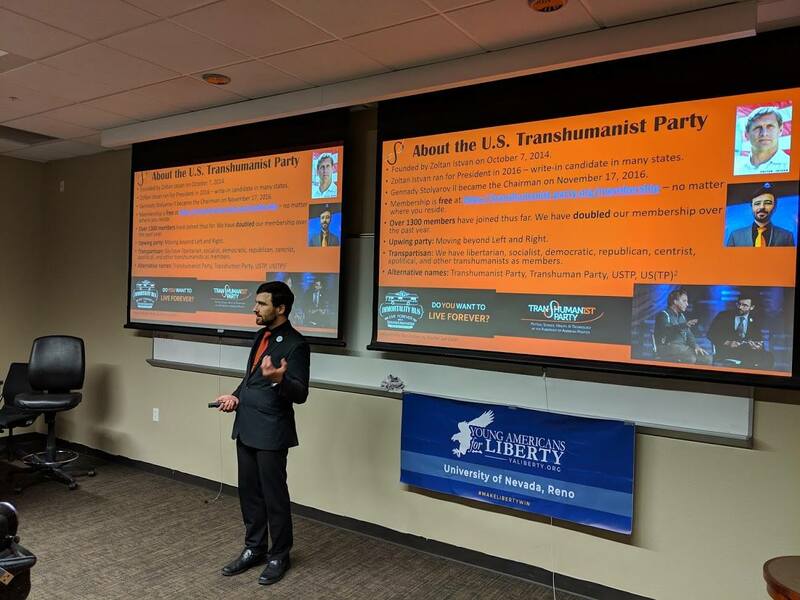 Watch the U.S. Transhumanist Party’s subsequent meeting at RAAD Fest 2018 on September 22, 2018 here. View Mr. Stolyarov’s official page for his candidacy for the Indian Hills General Improvement District (IHGID) Board of Trustees. U.S. Transhumanist Party Director of Visual Art Emanuel Iral has designed new animated GIF images of the U.S. Transhumanist Party banner and logo. You can view them here and download them for your own use in promoting the U.S. Transhumanist Party’s endeavors and increasing public awareness of our vision and endeavors! This is a prime example of how members are able to contribute to the resources available to spread our message. The U.S. Transhumanist Party is a non-monetary organization, so all that we able to achieve, we do through the direct action and creative talent of our membership. The Nevada Transhumanist Party offers the following brief statements of position on the ballot questions currently before Nevada voters in the 2018 General Election. Position of the Nevada Transhumanist Party: The Nevada Transhumanist Party supports Ballot Question 1 as an expansion of the rights of crime victims to render those rights more symmetrical to the protections that those accused of criminal acts already receive. The Nevada Transhumanist Party strongly holds that due process is vital for both the accused and the victim of a crime. Section X of the Nevada Transhumanist Party Platform states, in part, that “each individual should be sentenced based solely on the consideration of the nature of that individual’s crime, its context, and its severity.” However, the nature, context, and severity of a crime can only be ascertained if victims are permitted to participate in the justice process, with full protections of their safety and right to be heard. One of the most important protections of Ballot Question 1 is “To have all monetary payments, money and property collected from any person who has been ordered to make restitution be first applied to pay the amounts ordered as restitution to the victim.” This shifts the focus of the justice system toward compensating the victim, instead of simply enriching the state. A restitution-oriented justice system is ideal where the damage from a crime can be repaired or compensated monetarily, as this approach actually endeavors to make the victims whole and thereby undo as many of the ill effects of the crime as possible. The more lives can be repaired in this way, the fewer obstacles to innocent individuals’ flourishing will exist, and the faster our society will progress in economic, moral, and technological dimensions. Position of the Nevada Transhumanist Party: The Nevada Transhumanist Party supports Ballot Question 2 as a protection for the morphological freedom of individuals. The morphological freedom of female individuals is infringed by asymmetrical taxation of products that those individuals uniquely require. While the Nevada Transhumanist Party does not oppose sales taxes per se, exemptions from sales taxes for the necessities of life are reasonable if such taxes pose impediments to individual quality of life or even the ability to afford those necessities. Position of the Nevada Transhumanist Party: The Nevada Transhumanist Party supports Ballot Question 3 to eliminate the coercive energy monopoly currently held by NV Energy and allow individuals to choose their utility and source of energy, much like they are able to choose which furniture or which cars to buy today. NV Energy has used its monopoly position to stifle and penalize the deployment of economical rooftop solar systems, which allow homeowners to autonomously generate their own electricity and even earn some money doing so. The suppression of such opportunities is a travesty of justice and needs to be reversed. The NV Energy monopoly is not only harmful to technological progress, renewal energy, and affordable electricity costs; it is also a danger to the health and safety of homeowners. This is because of NV Energy’s arcane, deliberately circular call-center system, which gives consumers “the runaround” when consumers attempt to contact NV Energy to request emergency service related to failures in the electrical panels on their homes. NV Energy has connected the main circuit-breakers on many such panels to its “smart meters”, which require the intervention of an NV Energy technician to disable to that the circuit-breakers can be worked on and repaired or replaced. However, NV Energy does not offer consumers a dedicated emergency response to promptly allow access to those consumers’ own electrical systems in situations where hours and even minutes matter for preserving life and property. The Nevada Transhumanist Party considers particularly reprehensible the “No on 3” campaign in Nevada – orchestrated and almost exclusively (99.99%) financed by NV Energy and its connected organizations – which has been disingenuous in its messaging and which has created many mistaken impressions on the part of the public. Question 3 would only deprive NV Energy of its monopoly powers; it would not mirror the California-style (pseudo)-“deregulation” of the late 1990s, nor would it thwart any renewable-energy projects. Quite the contrary, it has been NV Energy and only NV Energy that has stifled efforts by consumers and rooftop-solar installers to create genuine alternatives to NV Energy’s electrical grid and its intentionally cumbersome and restrictive policies. Question 3, indeed, would require that the Nevada Legislature “ensure that protections are established that entitle customers to safe, reliable, and competitively priced electricity;” and “protect against service disconnections and unfair practices” – protections that are currently absent because of the NV Energy monopoly’s political connections, asymmetrical lobbying clout, and the regulatory capture of the Public Utilities Commission. Nevada’s voters overwhelmingly approved Question 3 in 2016 (72.36% voted in favor). Now that NV Energy has launched a last-ditch campaign in reaction to the jeopardy in which its monopoly finds itself, voters should inform themselves and see through the misleading rhetoric of the “Coalition to Defeat Question 3” (i.e., NV Energy). The Nevada Transhumanist Party staunchly supports Question 3 as the pathway toward major technological progress and innovation in the realm of energy, harnessing the forces of market competition to provide cleaner, more affordable electricity for all Nevadans. Position of the Nevada Transhumanist Party: The Nevada Transhumanist Party supports Ballot Question 4 to exempt durable medical equipment from sales and use tax. These taxes can often run into the thousands of dollars for sick and dying patients and could compromise the quality of their care. We support any measure that helps make medical equipment affordable and more widespread. Position of the Nevada Transhumanist Party: The Nevada Transhumanist Party opposes Ballot Question 5. While the Nevada Transhumanist Party supports efforts to render voter registration easy and seamless, the particular requirements of Ballot Question 5 would entail the DMV being mandated to insert disclosures that encourage voters to select a major political-party registration by including a statement “that the person will not be able to vote at a primary election for candidates for partisan offices of a major political party unless the person indicates a major political party affiliation”. Such wording – which would essentially compel a State agency to advertise for the major political parties – would further skew the political arena toward the major political parties and would entrench their dominance. Voter registration should furthermore always occur on an opt-in, rather than opt-out, basis; this is the only approach that consistently respects individual autonomy and choice to participate in the political system or to abstain from such participation. Opting in should be easy and made available through a variety of methods (including electronic, same-day registration), but the presumption of registration can create logistical difficulties for some individuals and conceivable situations where an automatic “updated” registration generates needless contradictions in a person’s registration status, which would actually render it more difficult for that person to subsequently cast a vote. Position of the Nevada Transhumanist Party: The Nevada Transhumanist Party opposes Ballot Question 6. While the Nevada Transhumanist Party supports economical renewable energy and the acceleration of efforts to develop technologies to render as much of our energy supply renewable as possible, the ability to affordably generate 50 percent of the total electricity through renewable energy resources is ultimately a technological challenge, not a political one. If the technology is ready, and the market is robust and competitive enough to deploy it to consumers at more attractive prices than fossil-fuel energy, then a 50-percent or greater renewable proportion of electricity will be achieved by 2030 without the need for a mandate. If, however, the technology cannot yet render renewable energy competitive with fossil fuels, then the only effect of the mandate would be to push up costs and constrict supply of electricity to consumers. The surest way to bring about a future of greater renewable energy is to repeal the NV Energy monopoly which has been standing in its way. Through competition, both technological and marketing innovations will thrive and will deliver renewable energy solutions to consumers. Ballot Question 3, rather than Ballot Question 6, is therefore a superior means toward that goal. Mr. Stolyarov is the Chief Executive of the Nevada Transhumanist Party and Chairman of the U.S. Transhumanist Party. This post may be freely reproduced using the Creative Commons Attribution Share-Alike International 4.0 License, which requires that credit be given to the author, Gennady Stolyarov II (G. Stolyarov II). Find out about Mr. Stolyarov here. – Whether privacy will remain in a more technologically interconnected future. Join the U.S. Transhumanist Party for free, no matter where you reside by filling out an application form that takes less than a minute. Find out about Death is Wrong – the illustrated children’s book on indefinite life extension.